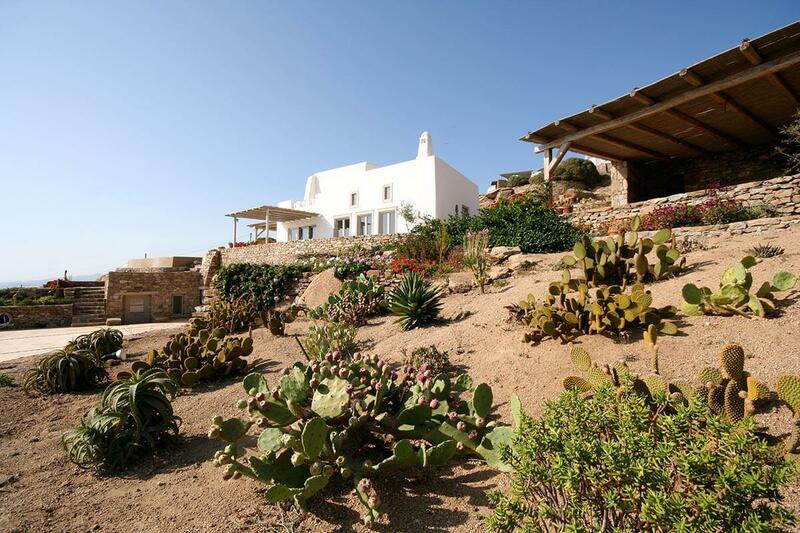 The property is spread over several natural terraces connected by quaint stone paths. 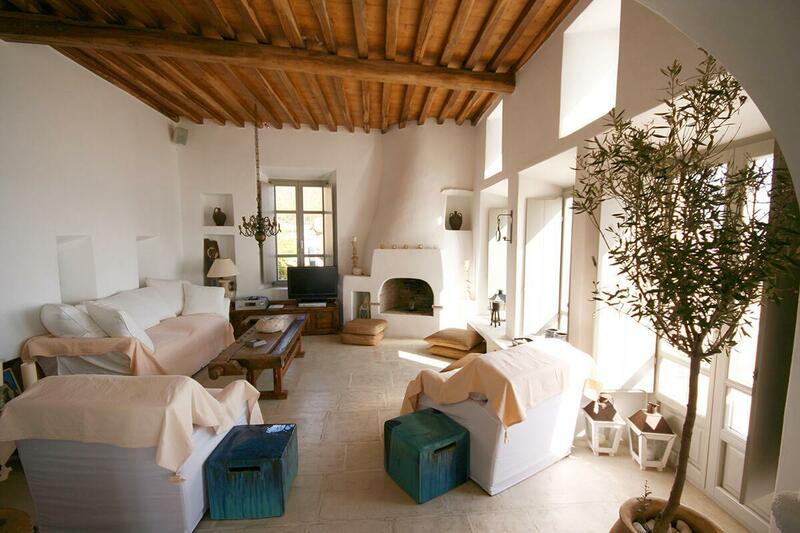 Villa Skyler consists of three buildings—the main house and two separate guesthouses. 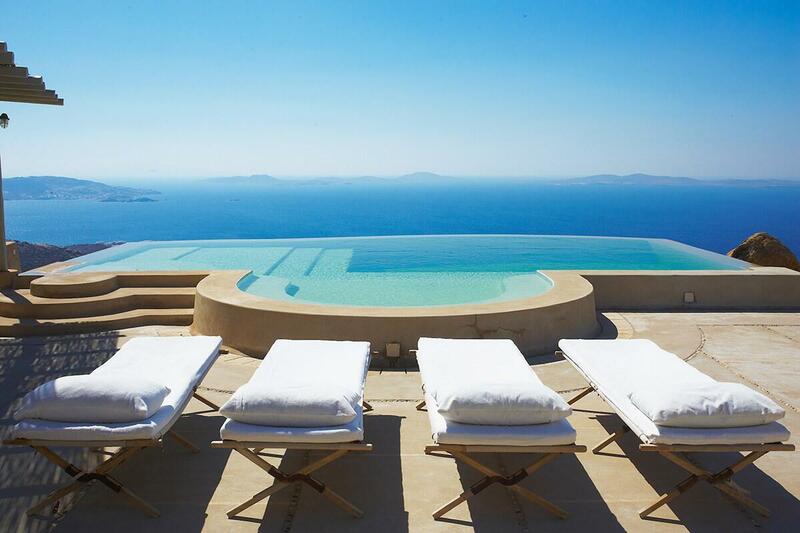 Located uphill in a unique wind-sheltered position in the Fanari area, Villa Rosemary enjoys one of the most beautiful panoramic views in all of Mykonos. This chic Greek villa overlooks the islands of Tinos, Syros and Delos in the Aegean archipelago. Magical sunsets are the pièce de résistance every night at this spectacular seaside villa! 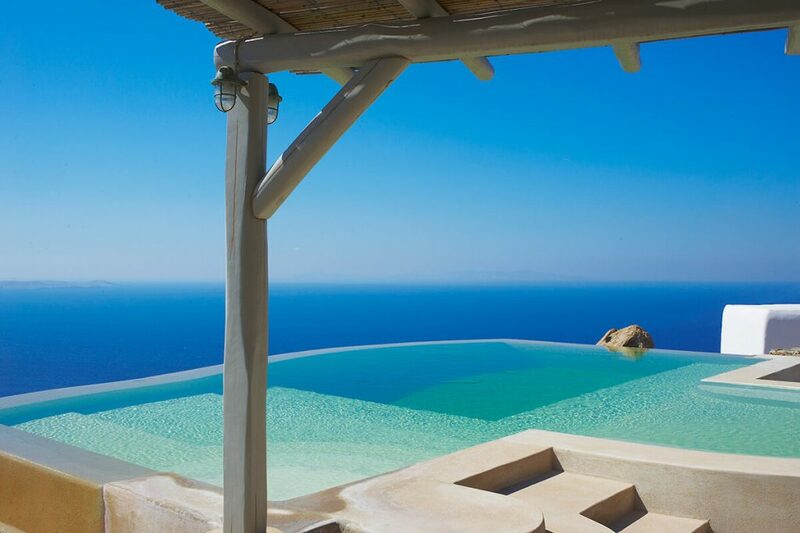 The infinity swimming pool features an intriguing shape—a large rectangle topped with a semicircle. 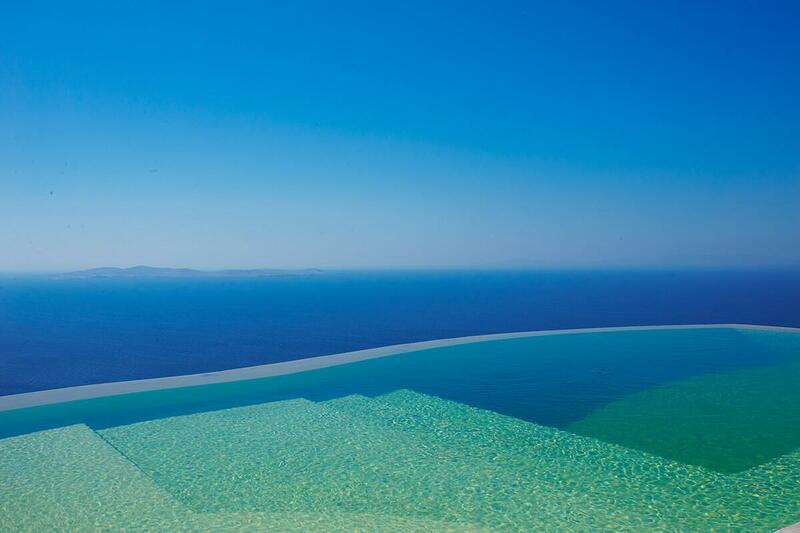 The vast pool offers panoramic views while the infinity-edge creates the illusion of its waters mingling with those of the Mediterranean. 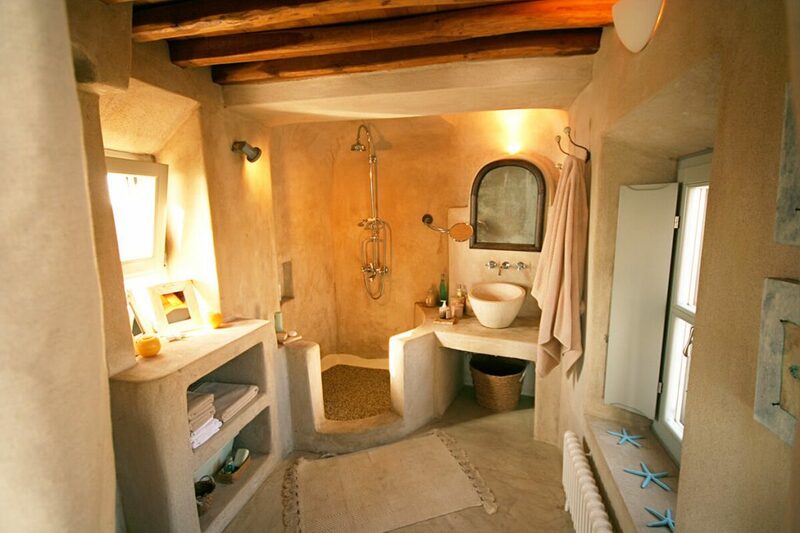 With a built-in spa, you will emerge relaxed and rejuvenated like never before. The outdoor setting is well appointed with antique wooden furniture, curios and artifacts. 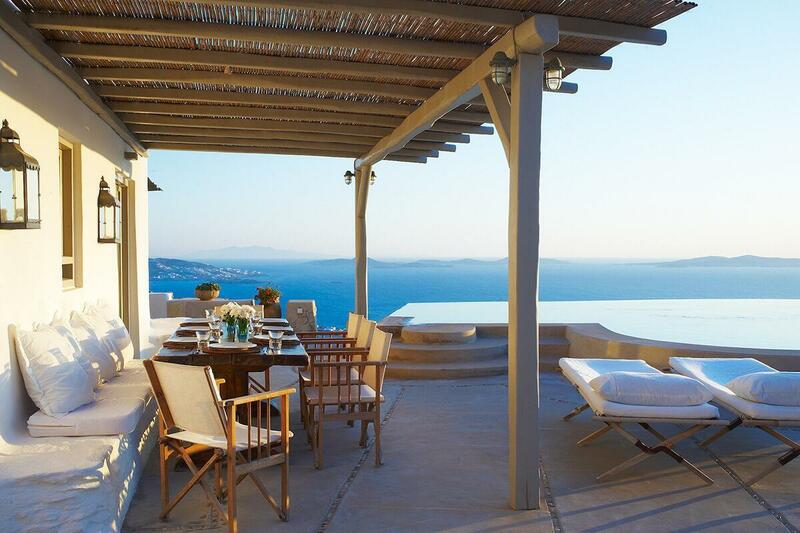 There are several terraces and pergolas where you can recline in sun or shade. 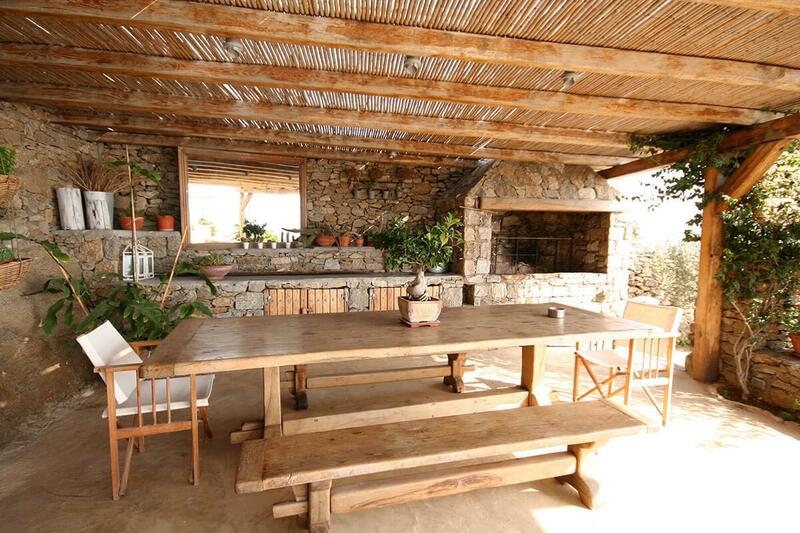 A wood fire barbeque sets the tone for lovely alfresco dining. Villa Skyler also includes satellite TV, DVD/CD players and Wi-Fi access. Housekeeping is included with your reservation. 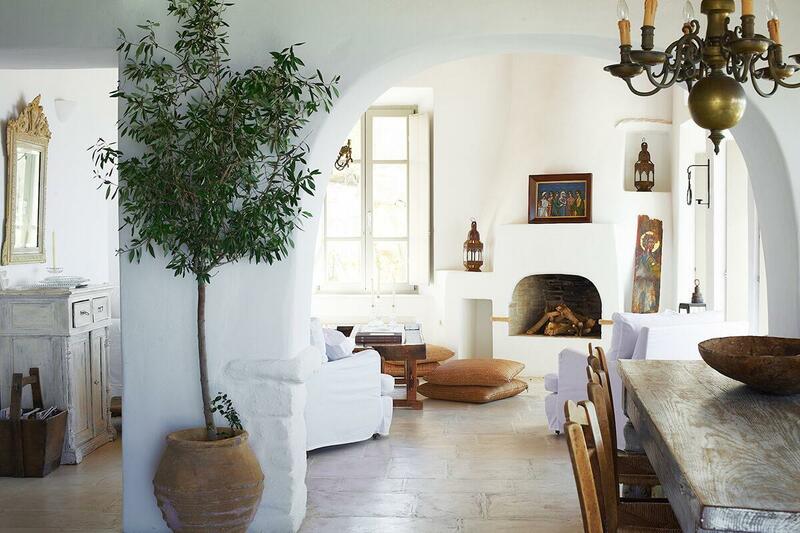 The style and feel of this property combines the typical Cycladic architecture with elements of Provencal country style, giving this villa a special charm and remarkable appeal. 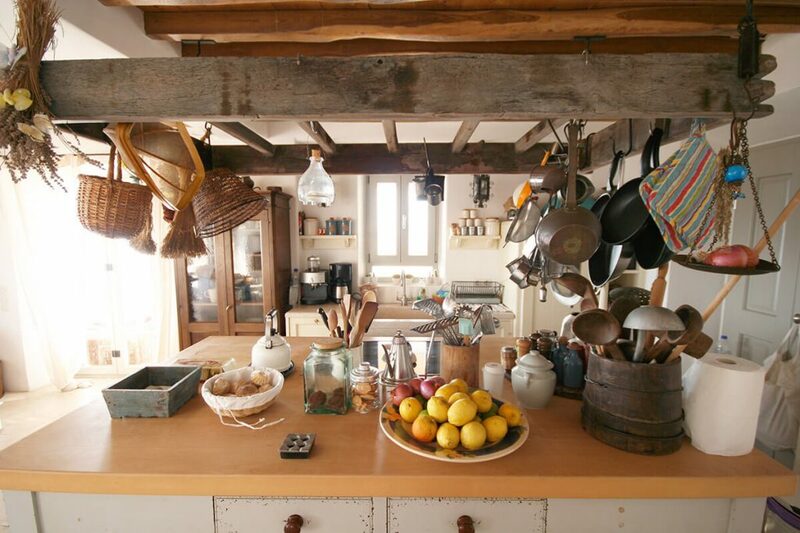 The main house features a beautiful open plan kitchen, while the living room is bright and cozy. 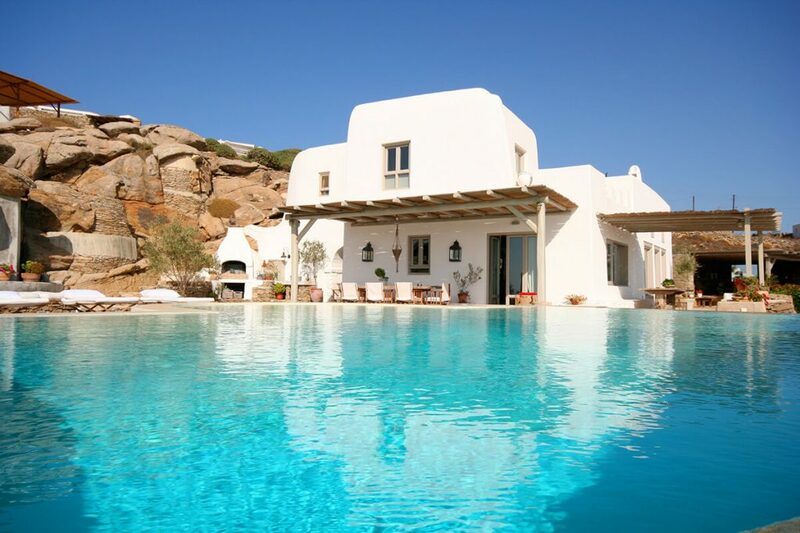 One of the two guesthouses is located below the pool and main patio, while the second, with kitchenette, is located above the main villa, next to a tiny private chapel. 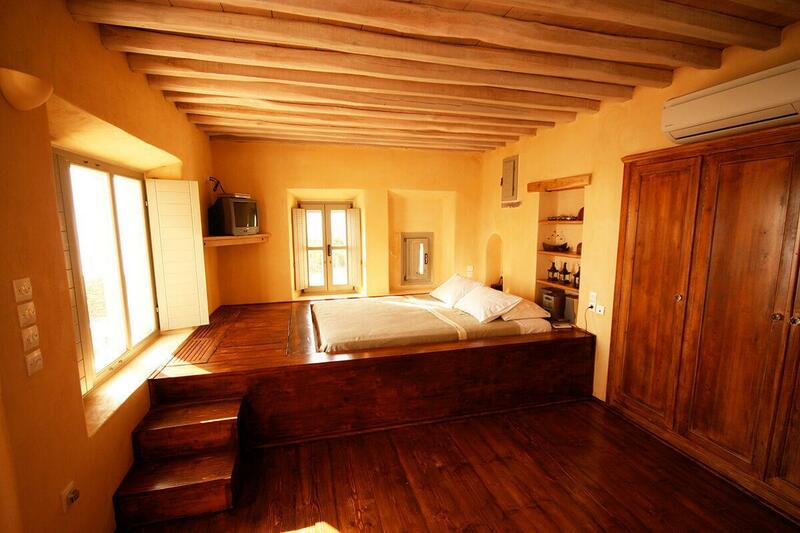 Seven delectable bedrooms accommodate up to fourteen guests at Villa Skyler. 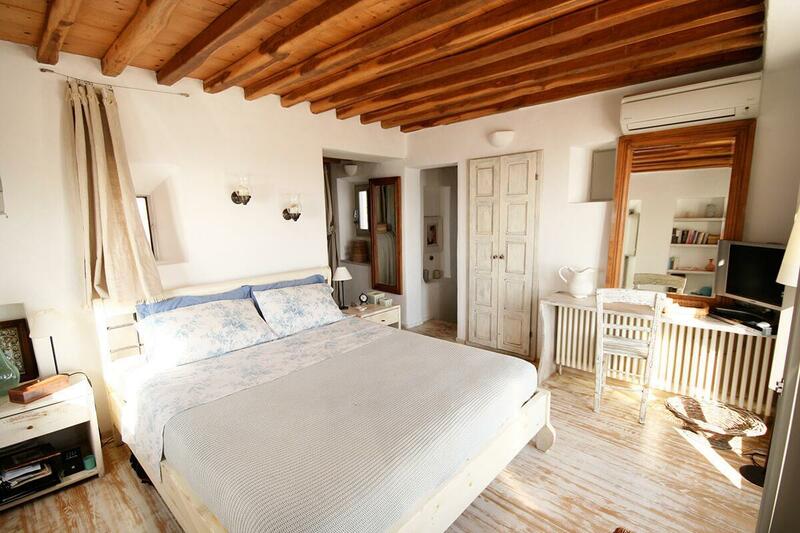 All of the bedrooms feature air conditioning, and there are six en-suite bathrooms. Four of the bedrooms offer direct terrace access, and the suite on the upper floor includes a rooftop terrace—perfect for starry nights! Nothing says Mykonos like sixteenth century windmills and the buildings perched on the water in Little Venice. Built on the water’s edge to accommodate the fast-paced lives of swashbuckling pirates, the Little Venice of today endures as the quintessential place for travelers to grab a bite as they watch the boats go by. 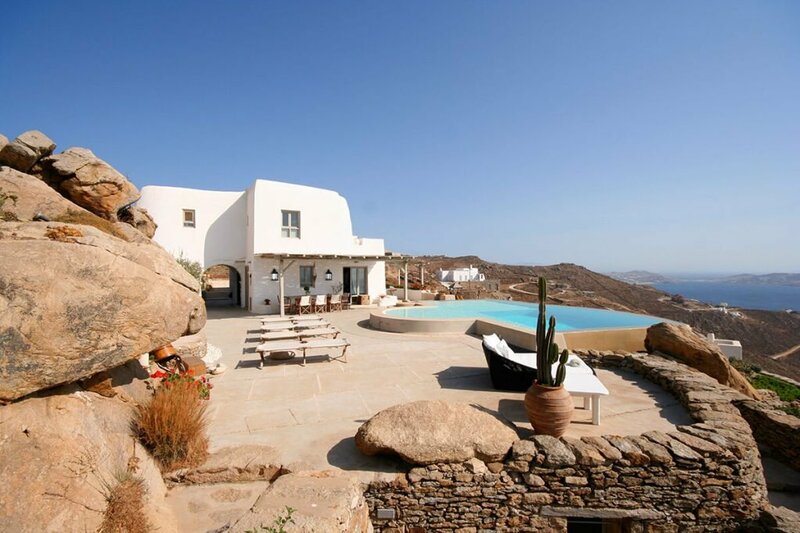 The Paraportiani church and the island of Delos could also be on the itinerary during your stay at Villa Skyler!